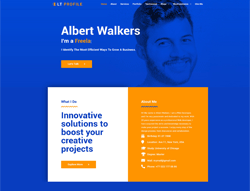 LT Profile is premium template tailored for Portfolio websites. This template helps you display your personal detailed information on your website to serve the job. In addition, it allows you to express your own ability and helps employers find the human resources. LT Profile supports mobile devices with 100% responsive layout, clean and stylish. Furthermore, it also builds with extremely bootstrap based on strong template framework with unlimited positions, powerful shortcodes and easy to drag-drop layout content. The template comes with 4 colors schemes helping to create amazing websites with various layouts.